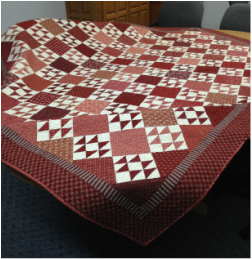 The Double "X" quilt, donated by Virginia Bissen, is made of Civil War reproduction fabric colors of cranberry 'n cream. The quilt measures 86" x 95" and is 100% cotton. It can be used on a double or queen size bed as a quilt. Raffle tickets will be sold and the quilt given away at the school's open house on Wednesday, September 2. Thank you, Virginia, for your generous donation! Welcome to the Sacred Heart Council of Catholic Women. We are strong in our commitment to prayer, service, school and community. Women and families are organized into 12 units who meet regularly in service to the Sacred Heart Church and School community. Scroll down for unit rosters and contact information. As an adult member of Sacred Heart Parish, each woman, along with her family, is welcomed into the Sacred Heart Council of Catholic Women. Together this group comes together to help each other, pray for each other, serve the church, school, and community. We hope you will get to know one another and enjoy working side by side in an effort to serve our parish and community. Units meet on a monthly or as needed basis. Each unit is comprised of approximately 22 families. Each unit will be asked to select a President and Secretary/Treasurer to oversee the service and financial activities of their unit. If the unit chooses, a coordinator can be selected to coordinate each of the individual activities and report to the President and Secretary. Members and their families are encouraged to let their officers know the areas they are willing and able to help with. This team work greatly helps in planning and shares the work among all members. We do need all members for the banquets and main projects. If you are unable to work at your assigned task, we ask that you find a replacement. If your health does not allow you to work in some area, please let us know so that we may be respectful of your needs. The duty of the head officers is to coordinate the Council wide projects such as the Annual Beef Dinner and the banquets that are contracted. The head officers will also coordinate and lead quarterly meetings in the months of February, May, August and December. These meetings are an opportunity to gather and discuss needs, concerns, and ideas for improving our organization. In addition to these quarterly meetings, communication will be provided through this website for those interested in sharing their opinions, but are unable to make the quarterly meeting. As members, we are proud to be of service to our parish and community. Each unit takes one month each year to serve. Please contact your unit officer to volunteer to help with these activities. Funerals are served by units on a rotational basis. The SHCCW President will contact the unit president when your unit is to serve a lunch/meal following a funeral. There is no set charge for this service. The unit will accept a donation from the family. The family will set the menu from the following choices: casserole, sandwiches, coleslaw or jello, cake and/or bars, and beverage. If the family requests cake/bars, the unit will provide these items by requesting donations from unit members and from the buddy unit if needed. The unit will provide set-up and take-down of all tables and chairs. The unit will serve the meal on the china plates and use the church. The Adams Health Care Center will be visited each month by a different unit to host a bingo party or musical entertainment on the third Wednesday of the month. The unit must be at the Health Care Center by 2:00 pm to help bring the residents to the main dining room. Entertainment will begin at 2:30 pm. If playing bingo, the unit will provide prizes such as bananas, cheese puffs, Little Debbie treats, etc. These items may be purchased at the unit’s expense from Heimer’s Grocery. Please call the Health Care Center for current numbers needed. The unit also provides a snack for the afternoon. This snack can include items acceptable to a senior diet—including quick breads, cookies or ice cream. Each unit is asked to deliver Meals on Wheels to the residents of Adams for two weeks each year. Meals are delivered Monday through Friday. The number of deliveries fluctuates. Meals are to be picked up at the kitchen door of the Adams Health Care Center no later than 11:20 am each day. The center staff will provide meals in coolers and the resident’s addresses. The residents will return the previous day’s containers which you will return to the health care center. Many find two people delivering the meals to be an easy option, one to drive and one to deliver! Church cleaning is done by one unit each month. The unit is expected to provide cleaning on Friday afternoon or Saturday morning the first weekend of their assigned month. Complete instructions for cleaning are found in the sacristy closet. One or two cleaners can easily complete the cleaning in one hour.